Two men killed when a light plane crashed near an airport died accidentally, an inquest jury ruled. Mid Wales airport founder Bob Jones, 60, and Steven Carr, 55, from Ruthin, were killed when a twin-engine Piper plane crashed on Long Mountain, near Welshpool, Powys, in January. An accident investigator said the aircraft could have either dropped into cloud which obscured trees or part of the controls had jammed. But jamming was a very rare occurrence. Giving evidence to the inquest in Welshpool, senior air accident investigator Paul Hannant told the hearing there were two possible causes of the crash. One was that the plane had inadvertently descended into cloud and had obscured some trees, while the other was that a part of the plane's controls had jammed, resulting in the pilot striking the trees. But he said that jamming of an elevator control was a very, very rare occurrence, and that an inadvertent descent was the more likely explanation. 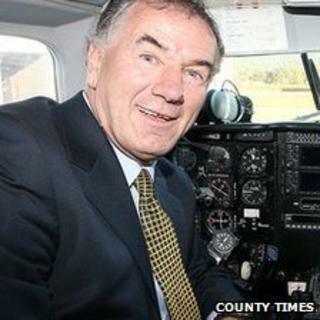 The inquest heard that Mr Carr, a former airline pilot, had taken a job freelance flying with some companies. He was at the airport on the day of the crash to gain more flying experience in the twin engine Piper plane. Mr Hannant said Mr Carr had 11,000 hours of flying experience and had flown the Piper before, but not for some time. The investigator said Mr Jones, the airport's owner, knew the area very well and had 17,500 hours of flying experience - including 2,177 hours in the Piper - and also held a helicopter pilot's licence. "He [Mr Jones] was the pilot helper on the day," said Mr Hannant. "The aircraft took off at 11:06 and went south, south west and went to 3,000ft (915m). It did a gentle left turn back to the airfield and came down to a lower height." Mr Hannant said the plane made a gentle descent to 1,400ft (425m) adding that the crash happened 11 minutes after take-off at 11:17. The inquest heard that Mr Jones and Mr Carr had decided to fly a few circuits of the airport but the passage of flight was slightly wider than usual. Mr Hannant said there were two possibilities for this - it might have been good practice for Mr Carr or because a helicopter was in the area. He said the aircraft did not have a voice or flight data recorder. The jury were shown a series of photographs, including one of the crash scene and another of some low cloud in the area. The jury heard that Mr Carr was in the left hand commander's seat in the plane while Mr Jones was sat on the right hand side. Just before take off an airport webcam showed murky conditions but conditions had brightened before the aircraft took to the air, Mr Hannant said. Mr Hannant said: "The plane struck trees and a wing tip came off. It struck the ground with the right wing tip." He said the aircraft was taken to the Air Accident Investigation Branch's headquarters in Farnborough, Hampshire, for examination and that both engines were found to be working properly. The inquest also heard that the Piper aircraft was serviced in October 2011 and the engines had been overhauled in August of that year. In a statement Mr Jones' family said: "We fully accept the coroner's findings. "Bob's death has been a great personal tragedy for the family. "We hope that today's proceedings may close a difficult chapter in our lives. "We are proud of everything that Bob achieved - his memory will stay with us and continue to inspire us." A statement from Mr Carr's widow Tara, who was not in court, said: "On behalf of Steve Carr's family we just wish to say that our lives have been altered forever by the loss of a wonderful man. "We will carry our memories of him with us forever. "We fully accept the coroner's findings."